Back in November, Sony Pictures made a numberof changes to their upcoming release schedule, including a shift of their Flatliners remake release date, pushing it from the summer slot of August 18 to September 29. As it turns out, there was a good reason for that shift, with director Niels Arden Oplev assembling his cast once again for reshoots, which will take place in Toronto next month. If the studio would have kept the old release date, it would have been cutting it too close for comfort. IATSE 873, the local Toronto chapter of the International Alliance of Theatrical Stage Employees union, revealed on their website that Flatliners reshoots have been scheduled in Toronto for eight days, spanning July 24 to August 1. If Sony would have kept the August 18 release intact, the production would have certainly been rushing to get this new footage into the movie in just a few short weeks. Still, even with the release date delay, the production has just two months to complete post-production with the new footage, so perhaps we may see yet another release date delay. As of now, this project, which star Kiefer Sutherland recently described as a Flatliners sequel, will go up against Universal's American Made starring Tom Cruise and PureFlix's Samson. If Sony would have kept its original Flatliners release date, then the project would have had to go up against Lionsgate's The Hitman's Bodyguard, starring Ryan Reynolds and Samuel L. Jackson and Logan Lucky, starring Channing Tatum and Daniel Craig. Both of these projects are riding waves of new buzz, after recent trailers were received well by fans, so it very well may be a blessing in disguise for Flatliners to have shifted release dates, away from these two movies. Still, we'll have to wait and see how fans respond to this movie when the first trailer arrives, presumably at some point this summer. Flatliners follows a group of medical students who experiment on "near death" experiences that involve past tragedies until the dark consequences begin to jeopardize their lives. Each one of them has their heart stopped before being revived instantly, which causes them to experience nightmarish visions of their childhood, reflecting either sins they have committed, or sins committed against them. Their unorthodox extracurricular studies have very dark consequences, as their supernatural visions begin to intensify. Many were surprised when original Flatliners star Kiefer Sutherland returned to star, although his character was never revealed. However, the actor stated in an interview from July that he is actually reprising his role as Nelson Wright, although he has changed his name and is now a medical university professor. 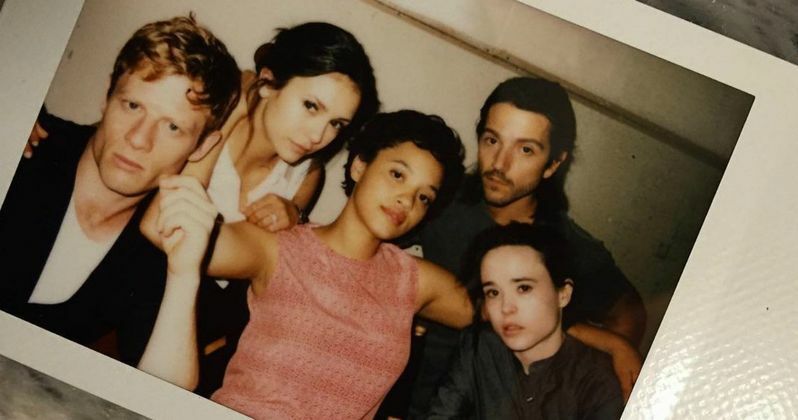 The new cast of Flatliners includes Nina Dobrev, Diego Luna, Ellen Page, James Norton, Kiersey Clemons, Charlotte McKinney, Beau Mirchoff, Steve Byers and Daniel Barbosa. Niels Arden Oplev (Dead Man Down) is directing from a screenplay by Ben Ripley (Source Code). Actor Michael Douglas, who also produced the original Flatliners, returns to produce this sequel alongside Laurence Mark and David Blackman. It isn't known if the entire Flatliners cast will be back for these reshoots, but hopefully we'll have more official details about this project soon.